Review: What was I doing here, away from everyone I cared about? Have you ever felt this way? This is exactly how Allegra Katz (Ally) feels as she decides her future career as a pianist or not. Though years away from college, Ally can't help thinking whether she made the best decision to play piano for 6 years. Should she continue to learn piano in THE Julliard music school in New York? 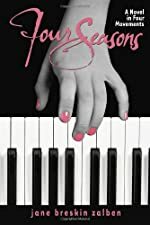 In Four Seasons by Jane Breskin Zalben, Ally has to make a choice to continue piano or not. Can she handle this much pressure and never-ending jam-packed days? Can Allegra Katz handle the pressure of piano practice 4 hour a day-every day? With friends, school, boys, and her personal life, will she (can she?) become a professional pianist? Ally just can't seem to find a way to tell her parents. Her father is a professional violinist, and her mother a professional singer. Ally is afraid they won't understand the stress and pressure of playing not just her best, but the best. Will Ally take a short break? Will she quit Julliard and stop playing the piano? Ally is afraid. Ever since she was 7, she has gone to Julliard. If she stops now at 13, what will she do for the rest of her life? I really like Four Seasons because it is a relate-able story. The story of how a 13-year-old girl struggles to make decisions in her life is simple, yet ends complicated. I also like the hook of the book. Allegra states that "Just thinking about giving up piano makes me break out in hives. My parents would disown me." Sometimes doing something you love is fun. But, when your life is centered on making it perfect? Not so much. The hook is very catchy. I wanted to read on, and find out: why does this person think quitting piano is such a big deal? Also, the pace of the story is just right. Whenever I thought the story was slowing down, it just picked right up and kept on going. There is never a part when the book completely stopped. I was also intrigued by the different types of characters, so delicate, yet ferocious when you get to know them. I really like Four Seasons and if you love realistic-fiction books, you should read it too! Review written by Sahaj (6th grade student). We would like to thank Random House for providing a copy of Four Seasons for this review. Have you read Four Seasons? How would you rate it?